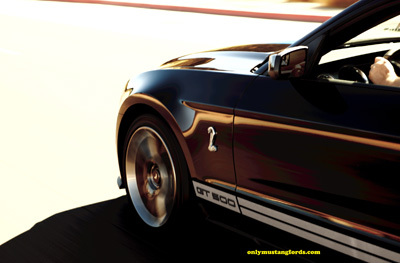 The 2012 Shelby GT500 is now available and as expected, one of the most powerful new muscle cars on the block. With a fire breathing supercharged 550 horsepower aluminum V8, it's another significant performance step above both, the new 5.0 liter Coyote V8 and the upgraded Boss 302 power plant. 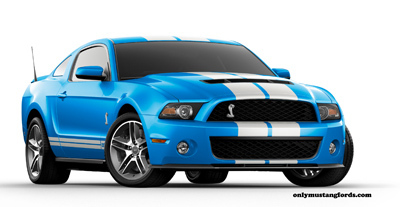 Little has changed for the 2012 Shelby GT500 incarnation. The car comes standard with 19 inch painted aluminum wheels, that look similar to some Mercedes AMG wheel styles. The GT 500 comes with it's own stripe package, featuring a GT 500 double stripe just above the rocker panels on both sides, along with the expected double racing stripes from front to rear. Also familiar is the blacked out diagonal grill work at front. 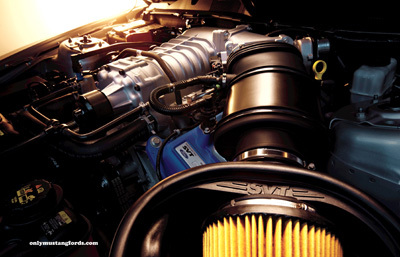 If all this power and performance isn't everything you ever needed there's an upgrade just for you. It's called the Shelby GT500 Performance Package. The new addition is distinguished externally by it's staggered wheel sizes, with 19 inch painted rims on the front and 20 inch painted forged aluminum wheels at the rear, with 265/40/zr19 tires on the front and 285/35zr/20's at the rear. It also comes with it's own distinctive stripe treatment, black chin spoiler and rear spoiler which has a Gurney flap (go figure). 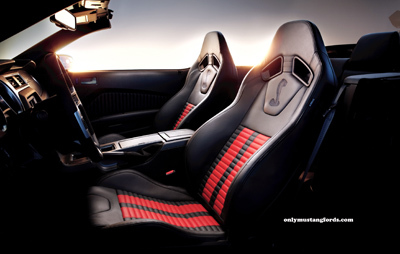 The one other major change you'll see on the 2012 Shelby GT500 is a cool new interior treatment focusing on slick fitted race car style seats and prominent color keyed stripes and Snake logo found in the center sections of the seats. In the Shelby GT500 Performance Package, you'll also find a new custom shift knob. As I mentioned earlier, the GT 500 comes equipped with the slick 5.4 liter 550 horsepower aluminum block V8, coupled to a Tremec 6 speed transmission. Amazingly, it's EPA fuel economy rating is a surprising 15 mpg city and 23 mpg highway. Thank the folks as Ford's Special Vehicles Operation facility for those numbers! While the changes are minimal on the standard 2012 Shelby GT500, the performance package adds a few more go fast and turn faster goodies, including performance springs at the front and rear, a special front stabilizer bar and performance package unique rear shocks. Speed is only good if you can stop and Ford has again gone to the popular and strong Brembo brakes, which include Brembo's better rotors and calipers. Along with the Performance Package are, an electronics package, which includes a voice activated navigation system, HD radio and a dual zone temperature system. the other available package at extra cost is an HID headlamp and security package. The security part includes a wheel locking kit and an active anti-theft system. And of course, Mr Shelby has his own even more powerful version of the GT 500 for your convenience, called the 2012 Shelby Super Snake, which boasts even higher horsepower levels from 600 hp if you need that warranty and up to 800 horsepower if ya feel lucky. Do ya?? 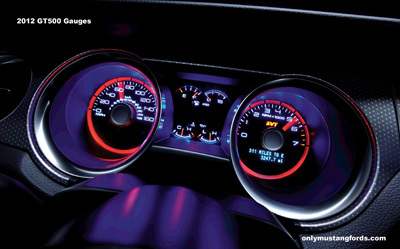 Pricing for the new 2012 GT 500 Mustang starts at $49,605 if you have the cash, and more if you plan on financing. The available convertible package starts at $54,605.